Active Shooter Security Expert Chris Grollnek M.S. For over 29 years, security expert and law enforcement professional Chris Grollnek has been immersed in the study and application of protective measures in the military, police, and private sectors. As the original founder of CGPGMG, LLC, the benchmark of “Active Shooter Prevention,” Christopher Grollnek is recognized as one of the nations leading experts regarding the active shooter phenomenon and events. Known as the Active Shooter Expert (#activeshooterexpert), Chris is a highly sought Public Speaker, Published Author and Corporate Security Consultant. Grollnek has testified about Terrorism and Counterterrorism training needs of the United States and beyond before the U.S. Senate Ways and Means subcommittees in the Hart Senate office building in 2002. Leading up to his testimony before the U.S. Senate, Chris Grollnek was invited by the Center for Strategic and International Studies (CSIS) in Washington D.C. to provide insight to PhD’s and Senior Executives Staff of the U.S. Government on subterranean training, complex curriculum development and public lectures. Although retired Chris remains continuously sought for public appearances, assessments and media consulting. Reestablishing himself, Chris Grollnek performs his work with a rich history in risk management, mitigation strategies, OSHA policy compliance, police best-practices, policy and security assessment programs. Focusing on cost saving initiatives for security departments that generally run n the overhead and expenditure column, Chris has found cost saving initiatives that actually show a return tear-over-year. These programs give emphasis on personal safety in public places while conducting risk management consulting to “C” Level Executives and Government Senior Executive Service professionals. Along with a team of highly experienced executives and former military officers, Chris Grollnek creates lasting value in CGPGMG’s services, which specialize in Active Shooter Prevention, Domestic Terrorism Prevention and awareness, mitigation, writing and media appearances. Chris Grollnek has earned numerous military and police certifications. As the former Secretary of the International Association of Undercover Officers, Inc., Chris maintains memberships in the National Tactical Police Officers Association (NTOA), Texas Tactical Police Officers Association (TTPOA), and the Texas Municipal Police Association (TMPA). Prior to the formation of CGPGMG, LLC, in October of 2003, Chris Grollnek was sworn in as a member of the McKinney Police Department assigned to the reserve unit, patrol division. In February of 2004, Chris became a full time officer advancing quickly through the department. Serving in each division of the agency, Chris has an impressive background of police experience. Early in his career, Chris worked with the gang unit, illicit narcotic street interdiction, and was selected ahead of several peers and supervisors to work in the highly coveted position as an undercover narcotics detective. Following his tenure in working undercover in federal and state prosecutions and a high caseload, Chris Grollnek latterly transferred to the detective pool working both crimes against persons and property. In 2007, Chris Grollnek was promoted to the rank of Corporal filling a sergeant billet for the patrol division power shift. Chris served with the departments part-time Special Weapons and Tactics Team in nearly every position from 2005 through mid 2008 and again in 2009 through his retirement in September 2011. The positions Chris held on the team included; permitter, entry team member, advanced tactics and firearms instructor, shotgun breacher, rural terrain tactics instructor, and training coordinator. Additional achievements during Grollnek’s police time include oversight for subordinate officers throughout the department. Chris Grollnek graduated the ILEA school of Professional Standards, Ethics, and Internal Affairs as a certified investigator. Chris has been awarded multiple merit awards and unit commendations for his tireless efforts in community safety endeavors including the Police Shield for bravery during a critical incident. 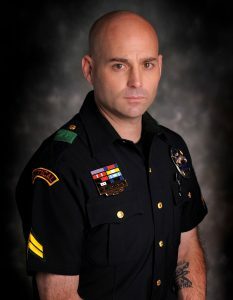 Prior to joining the McKinney Police Department, Grollnek was a member of the United States Marine Corps from 1992 through 2003. Chris Grollnek spent his final three years with the Marines as Reserve Battalion Operations Chief and Armory Staff Noncommissioned Officer in Charge for the 4th Reconnaissance Battalion in San Antonio, Texas. Grollnek served in various capacities with the Marines, including Master Instructor, Weapons Expert, Senior Drill Instructor, and Close Combat Instructor. Decorated for his military service, Chris Grollnek holds a Navy Commendation Medal, an Army Commendation Medal, an Army Achievement Medal, 3 Navy Achievement Medals, and campaign ribbons and medals along with seven expert awards for marksmanship with both the rifle and pistol. A graduate of the University of South Carolina, Chris Grollnek earned an Associate of Arts in Education and a Bachelor of Science in Business Management and Leadership Studies from University of Maryland University College. In March 2012, Chris Grollnek received his Master of Science in Administration of Justice and Security with a 4.0 GPA graduating with honors from the University of Phoenix. In October of 2011, Chris Grollnek was inducted into the National Criminal Justice Honor Society in the Eta Theta chapter of Alpha Phi Sigma at the University of Phoenix, Inc. Recognized for his service to the community, Chris Grollnek has donated his time and energy to a wide range of philanthropic causes on a local, state, and national level. Over the years, Grollnek has volunteered at the McKinney Independent School District gang and awareness group; the Nexus Recovery Center, Inc.; the Texas Substance Abuse Prevention Coalition; and Scott’s Helping Hands, which he cofounded in 2007 to address issues of adolescent substance abuse. Away from his work, Chris Grollnek enjoys all manner of recreational activities, practicing digital photography and reading whenever possible. Along with his family, Chris Grollnek is retired and resides in McKinney, Texas. Chris Grollnek Drill Instructor Rifle Manual Teach Backs Continue reading → The post Drill Instructor Sergeant Grollnek appeared first on Active Shooter Expert | Keynote Speaker | Network News Guest | Contributing Author. Chris Grollnek #ActiveShooterExpert © #ModernDayGunFighter © Operated as a blog by a domain user since 1-1-07.